If you haven’t been to Christ Church lately, we imagine you’ll be delighted to see the changes made during our renovations! The five original windows have been opened up, shedding beautiful light into the chancel. The newly shaped chancel area is spacious and allows for some wonderfully new opportunities for worship, as well as performances. A beautiful new altar has been made for us by a parishioner, and the Altar Dedication was held on Wednesday, November 28, 2012, with Bishop Shaw officiating. The handicapped accessible communion rail, which is removable, is wrought iron to match the balcony railing, and was measured perfectly to hold the beautiful needlepoint kneelers lovingly made for us by parishioners years ago. The center aisle red carpet has been removed and has been replaced with tile, which goes from the two narthexes, down the center and side aisles, and around the chancel steps. (The existing cork floor remains under the pews.) The existing light fixtures have been retrofitted with many more bulbs and much less energy use. New retrofitted fixtures not only allow for improved lighting, but showcase the detail of the ceiling not previously seen. The font has been placed at the rear of the center aisle, below the balcony, with surrounding shorter pews to allow for weddings and funerals. The finish woodwork matches the existing wood perfectly! Moving into the bell tower, a new staircase has been built to allow access to a new balcony that holds the organ and choir. After much stone work to the tower, the cut-through to the balcony was made. 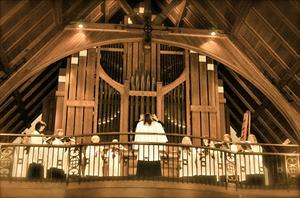 Our new organ, Opus 137 by C.B. Fisk, Inc., was delivered on November 13, 2011 -- quite an amazing day in the history of Christ Church! A wrought-iron balcony railing was installed after the organ was put in position. The organ then went through months of "voicing", a painstaking and delicate task to make sure that each of the 2,002 pipes sound perfect in this particular acoustical setting. We are very appreciative of both the work and the donations of so many people to make these renovations happen! 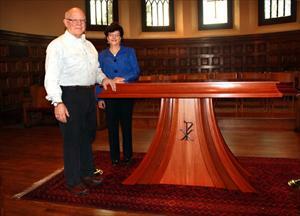 This photo shows our beautiful new altar that was lovingly designed and built by Allen Townsend, with help from his wife Carol Reid Townsend.